Robert Ludlum's abandoned hero Jason Bourne comes to life in The Bourne Identity, a rousing action film that starts a franchise, with Matt Damon stepping effortlessly into the role and confronting a mess of a broken life with danger around every corner. Jason Bourne is floating in the Mediterranean Sea, unconscious and with two bullets in his back. Picked up by a fishing trawler, he is helped back to health by the fishing crew, but is suffering total amnesia. The only clue to his identity is embedded in his skin: a tiny laser projector with a Swiss bank account number. Making his way to Zurich, Bourne finds his safety deposit box: it's filled with a large amount of money in different currencies, multiple fake passports, and a gun. His address appears to be in Paris, but before he can travel, he finds himself being pursued and targeted. Despite remembering nothing, Bourne discovers that he has exceptional combat, surveillance and survival abilities. He doesn't know it yet, but Bourne is a CIA-trained assassin who has botched a hit against a deposed African dictator. His CIA black-ops unit, headed by Alexander Conklin (Chris Cooper), wants Bourne dead to clean up the mess, and soon a succession of CIA hit-men as well as police authorities from Zurich to Paris are after him. The only help Bourne gets is from Marie (Franka Potente), an unsuspecting US visa applicant who runs into Bourne at the consulate and agrees to drive him across Europe in exchange for $20,000. As his travel companion, Marie soon finds herself as wanted as Bourne, and she has to decide how much to stick around as Bourne tries to find a way to survive, stop the carnage, and confront his former controllers. Director Doug Liman briskly shepherd the action around Europe and finds the required delicate balance between humanizing Bourne and delivering highly kinetic action, including a terrific Parisian car chase. The film is sharply edited to capture the energy while keeping the action comprehensible, a skill lost in many subsequent action movies. 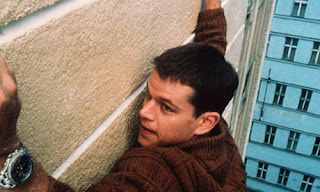 Damon makes the role of Bourne his own, and although he does not need to stretch, he mixes to great effect the icy coolness of an assassin with the confused anguish of a man who does not know his own name. Germany's Franka Potente holds her own against him, playing the weary Marie, quickly finding out exactly how much trouble is attached to the $20,000 that Bourne gives her. The rest of the cast is somewhat lightweight, but enlivened with relatively small roles for Clive Owen and Julia Stiles. The Bourne Identity is an enjoyable, intelligent action film, with a compelling central character buffeted by a neverending series of absorbing, if slightly over-the-top, calamities.